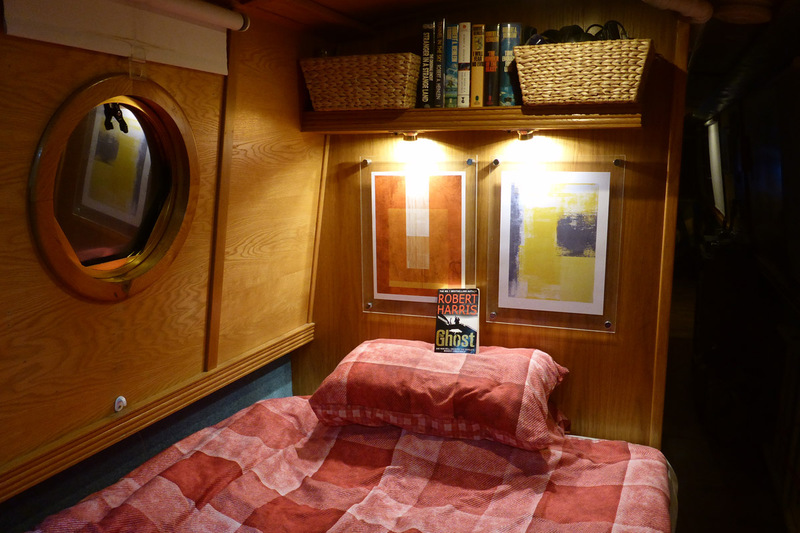 Reading in the Great Cabin, a Captain’s pleasure on a winter’s night. #narrowboat #England #amreading – The Diesel-Electric Elephant Company. There are many varied and splendid things about living on a boat in winter. One among these is that on a cold night I can retire to my cabin with a good book and a steaming mug of something fortified. If the weather is right and the water of the canal just that little bit alive then it is possible to hear the tiny wavelets slapping on the hull, and the damp fenders singing whalesong as they rub against the armco. Sometimes ducks nibble the algae that inevitably takes hold on the waterline of the hull, tapping their bills against the steel from one end of the Cardinal to the other. If it’s really quiet, and sometimes the canals are almost silent, I can lie in bed and listen to the coal settling gently as it burns in the stove, the heat being wafted around by the stovetop fan. Of necessity most additions to my library these days are bought from charity shops. In each new town I seek out the High Street, where if there is one charity set up in an otherwise impossible-to-lease shop then there will certainly be two or three or four such. Surprisingly, good books are hard to come by in charity shops, not, I suspect, because they sell quickly, but because the charities don’t know what makes a good book. They only give shelf space to the bright and shiny things, or to the modern classics such as Fifty Shades of Blethering & Obscene Nonsense. Quite often it is possible to tell with just a look through the shop window whether it will be worth my while taking my collection of warm and sticky pound coins in there to browse. I love hardback books, and I don’t care – within reason – how much of their previous life they show. A ragged ex-library copy, provided that it has all of its pages intact, is as much fun, maybe more, than something still in cellophane. I read a book recently where the previous owner had highlighted all of the editing errors, the dodgy spellings and ungrammaticalnessnousies, in thick HB pencil in the margins. That made me giggle because I found errors that they had missed. Sometimes you get a textbook or other non-fiction book in which all of the non sequiturs and logical inconsistencies have already been quite literally highlighted in yellow or blue or pink stripes. While I love hardbacks, I’ll take what I can get, and if a paperback looks promising then it will come home with me just as eagerly. If choosing it was a mistake then the book gets a brief voyage and is dropped off at the next port of call in any charity shop willing to (re-)take it. I like “bloke” books. Serious books, books with some (sensible, plausible) action, books with a world into which I can allow my brain-gland to dive from the high board and paddle around on its own for a while. I am a bit of an innocent abroad when it comes to plots. I either see where everything is heading immediately on reading paragraph one, or I have no clue right up until the dramatic end when the wet halibut hits me in the face. Generally I have no clue. In terms of plots I am an easy date, a cheap thrill, it doesn’t take much to keep me puzzled. A sheet of paper with “please turn over” written on both sides will keep me occupied for weeks. Yestereve I ran my fingers along the Cardinal’s 36′ of bookshelf and selected The Ghost, by one Robert Harris. A battered, paperback copy with a sticker on it telling me that I coughed up some 50p to some Respite Care Hostel for Elderly Welsh Chihuahuas for the privilege, or something. Well, neither my steaming fortified mug (both of them) nor the book lasted long. I read it last night, I woke in the middle of last night and continued reading for a few of the wee small hours, and I finished it this evening. For a book set mostly in somewhere known as “Martha’s Vineyard” it is really rather English. For a book about ghost writing and – dunt dunt der – politics – it was really rather thrilling. I didn’t guess the ending, not even with copious clues scattered by the author. Except for a while around two major, major lapses in his professional conduct, I actually cared about the main protagonist. I wondered if they were writing about Tony Blair, and I hoped that they weren’t writing about Tony Blair (can’t stand the man, he’s worse than a mere waste of protoplasm). The book kept me swept up and, as mentioned, kept me reading. I am a peculiar beast when I read. Moles have better eyesight than do I. I have to wear varifocal specs, and in the days before ultra-high-density lenses my glasses used to be so thick that I could inadvertently start forest fires just by turning side on to a low sun. I can’t read a book wearing my specs, I have to hold the thing two or three inches away from my fine, Roman, Hutson-family schnoz. This works well unless I decide to indulge in a midnight (or in this case, 3am) snack of a sandwich, when I have to move the book away to make room to get the sandwich into my face. Ditto my mug of whatever. When I am getting towards the end of a book I have to cover up the unread pages, otherwise Brain-gland will scan it from peripheral vision and tell me what the end is before I’ve officially got there. Do you want to know why I let loose a (very) loud laugh and giggle concerto not long since? It was because I was scanning through my books for tonight’s literary victim and I found another Robert Harris, this one “Pompeii”. Hardback this time. I am hoping that it is as good. I’ll let you know. Keep your fingers crossed. Nighty-night, sleep tight and don’t let the bed bugs bite (and don’t let them move your bookmark either, it can takes ages to find your place again sometimes). I’m sure we saw the film of Ghost a while ago with Ewan MacGregor and Piers Bronson. I love the idea of collecting books as you journey. Books are the best thing about charity shops. I think we all envy your cosy cabin and gentle waters. By ‘eck, sir, thy’s nobbut a reet superstar tha knows. 🙂 Thank you! As a collector of books myself I totally identify with this and marvel at how neat your cabin is captain. I ran out of book cases some time ago, you would hate my messy office, the floor being stacked with them. I also indulged in the Amazon free Kindle because I couldn’t read any books that only came in that format and can now read on my PC or my mobile phone (which like you I often do in the middle of the night if I am reading something I cannot really put down). My only problem is I can’t let any of them go and have even ‘taken in’ unwanted collections when someone died or moved elsewhere and couldn’t take them with them. I have two shelves now of my own books, kept (not as a vanity thing) to give to anyone who might want to read them. I always say “so many books so little time”! Tis a marvelous thing to be completely involved in a novel, to the exclusion of your real life. As I get older I find it’s harder and harder for me to do. I miss the days of my childhood when people could hold entire conversations at me and I wouldn’t hear a word of it because I was reading my book. I suspect it’s not my age but my internet addiction that’s killing it. Too many unrelated snippets of information zoom past me. And now I’m lucky to read blog posts to their finish.